There are so many ways to experience beautiful Flores, whether sailing through the sparkling island waters, hiring a car to drive across the lush, mountainous hinterland, or staying for a few days in the many villages dotted around the island. And for travellers who really want to see Flores, no filter or lens between them and the land, cycling has become a popular way to cruise the island. With just a warm breeze and the open road, you’re free to drift between villages, talking to locals, sharing food at their table - this is an unbeatable journey for the truly adventurous at heart. A cycling tour of Flores will change the way you see the world, and possibly how you see yourself. Imagine riding your bike down the side of a volcano, traversing jungle, green pastures and terraced rice fields as you head towards a village like Moni. Moni village is a favourite cycling stop, as the villagers greet travellers warmly, and the warungs put on a welcome feast of local food for the hungry cyclists. Spend a leisurely afternoon chatting with the locals who make the best tour guides, after all, no one knows as much about Flores as they do. They will happily help you to plan the next leg of your journey onwards to new discoveries. In our opinion the best tours take in the changing landscape, from mountains to rice terraces to the stunning coastline. Some of the roads are narrow and in particular there are some challenging passages along the coastline, only meters from the sea - so we do suggest saving those relaxing cold beers for once the ride is officially done for the day. If you’re cycling with guides, they will ensure that the road ahead is always safe. But if you’re more of a solo explorer without a guide, make the most of the local knowledge and chat with the locals along the way about the condition of the road ahead, particularly during the wetter months. Some of our suggested must-sees along the way are villages like Riung village. Like most coastal villages in Flores, Riung is populated by the Bajo people, the sea gypsies, who captivate travellers with their sea faring, nomadic existence and peaceful lifestyle. While the Bajo still base their lives around the ocean, the distinctive floating villages or stilt houses that they now live in give them a place to trade their fish as demand for the fishing industry grows. Another gorgeous spot to visit on your cycle tour is Soa Hot Spring, a natural spring and pool flowing up from an underground water source. After cycling for hours, soaking in the waterfall said to be rich in natural healing minerals will soothe tired muscles. And it doesn’t get much more relaxing than floating about in the large warm pool edged by serene gardens and trees. 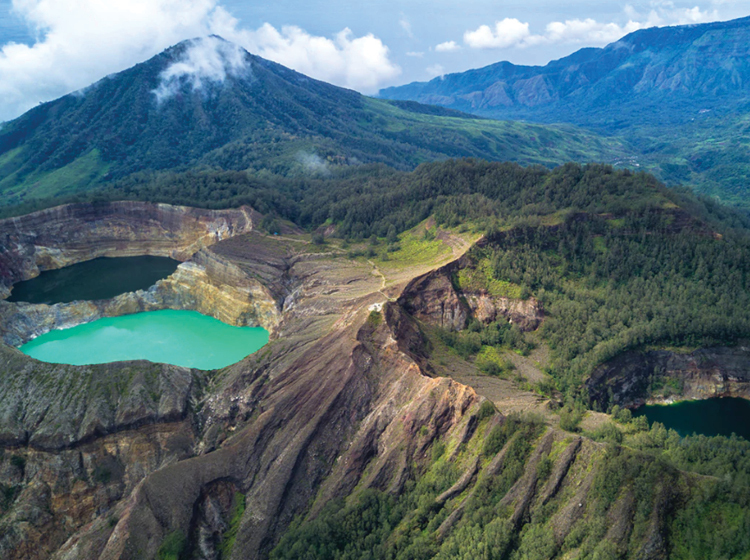 From here you could head into the town of Bajawa for lunch or dinner and dine under the impressive views of Iniere Volcano. Riding across the spectacular Flores landscape is an unforgettable experience, but trust us, there will be many breath-taking photo opportunities that you won’t want to miss, so don’t forget to pack your camera. Remember though, if you want to capture the local spirit, villagers going about their daily life or one of the frequent and beautiful ceremonies, please be respectful and ask for permission first. With so many natural wonders and beautiful people to meet along your cycle tour, planning is essential. You could plan your own tour or talk to the cycle tour gurus who do this every day, know all the best spots to visit and understand the conditions of the land and roads ahead of time. It’s up to you how far you ride, with some tours in the area covering shorter daily distances of around 30-40kms, suiting those who would rather spend more time exploring villages on foot and less time in the saddle. For the more experienced rider, there are longer tours that travel over 100kms a day, but with lots of downhills and rest stops, they are still more fun than work. Cycle tour guides also have relationships in the local villages, smoothing your passage through the area, and giving you a clearer snapshot of true Flores village life. Contact us for more information or please share your tour experience with us – we would love to share your journey!